We ambled down US-264 in an aging minivan, keeping an eye out for Bell Island Road near Swan Quarter. Our goal was to catch a glimpse of Deep Bay oyster sanctuary from the Bell Island Pier in Rose Bay. Jenny Holder, who recently received her master’s degree in geospatial information science and technology from NC State University, and I were on the hunt for all things oyster. We wanted to see oyster cultivation in action and create a new communication tool for the industry, a GIS story map. We had the good fortune of an excellent tour guide: North Carolina Sea Grant’s Marine Aquaculture Specialist Chuck Weirich. 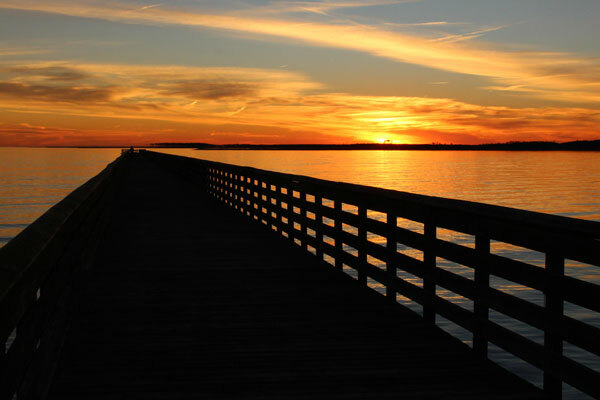 With its expansive shoreline — which includes Ocracoke Island and a large portion of Pamlico Sound — Hyde County has more water than land. (In its inventory of natural areas, the N.C. Office of Coastal Management notes that the county has 730 water acres and 634 land acres.) On our drive, we saw the landscape shift from brackish sounds to freshwater marshes and the massive Lake Mattamuskeet. The abundant water resources in this region support four N.C. Division of Marine Fisheries, or DMF, oyster sanctuaries: Deep Bay, West Bluff, Gibbs Shoal and Ocracoke. These constructed oyster reefs attract oysters, as well as clams, juvenile fish, crabs and marine organisms, which in turn draw larger fish. Hyde County also is home to commercial fishermen, shellfish aquaculturists and seafood processing facilities. Agriculture and forestry are other mainstays in this lightly populated county of 5,676 residents (the summer 2014 estimate) — only Tyrrell County has a smaller population. As a Tier One-designated county, Hyde County is considered distressed. A persistently high poverty rate (21.1 percent of individuals are below the poverty level) coupled with high unemployment (12.8 percent of the civilian labor force are unemployed) belies a lack of opportunity. The county boasts a rich natural resource base from which material wealth could be built. Oysters have the potential to be an increasing source of income and economic stability for Hyde County’s commercial fishing industry. Additionally, oysters provide numerous environmental benefits, including improving water quality through filtering nutrients and providing habitat for other species. Significant investments in oyster reef restoration and aquaculture in Virginia have led to remarkable growth that North Carolina might emulate. A 2015 shellfish aquaculture overview by Virginia Sea Grant reports that the farm-gate value of cultivated oysters in Virginia in 2014 was nearly $17.1 million, compared to just under $250,000 in 2005. While commercial harvest of wild oysters in North Carolina has been on an upward trajectory — growing 193 percent in value from 2004 to 2014 — the value of cultivated, or aquacultured, oysters has been stagnant. According to DMF’s statistics, the value of harvested wild oysters in 2014 was $4.54 million. Alan Bianchi, who tracks these annual commercial values for DMF, notes that farm-gate value for aquacultured oysters in 2014 was only $450,000. Those in the cultivated oyster industry say they face various hurdles to grow their businesses and satisfy market demand. On our trip, we stopped by Mattamuskeet Seafood Company near Swan Quarter to find out more about its business model. The Carawan family runs Mattamuskeet Seafood, a crab and oyster wholesaler. 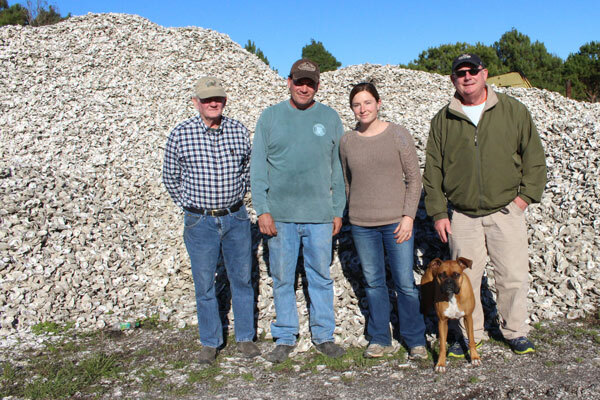 They have big plans to cultivate, process and sell a lot more oysters. 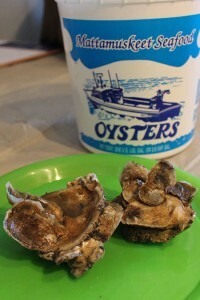 Traditionally, they had focused on processing Gulf Coast oysters to be shipped to northern markets. Now Cory Carawan, the son of Charles and Sherrie Carawan who started the business, is experimenting with oyster cultivation. Cory primarily grows spat-on-shell triploids, a sterile Eastern oyster that grows quickly. However, one of the limiting factors to selling more oysters is having sufficient labor to process them for the market. The company relies on foreign workers in the H2B visa program, resulting in a fluctuating labor force. On April 13, Mattamuskeet Early College High School will host an opportunity for area students to learn about the oyster cultivation business, as well as other aquaculture and seafood industries in their backyard. The day-long event is organized by Sea Grant and is part of the N.C. Science Festival. Chuck, Jenny, and I will introduce middle- and high-school students to the latest aquaculture technology, environmental science and career opportunities in the seafood industry. Our partners in this effort are Carteret Community College, North Carolina Coastal Federation, Hyde County Office of Planning and Economic Development, and Mattamuskeet Seafood. For Mattamuskeet High School science teacher Jennifer Cahoon, the event will allow her students to learn about science and technology on a topic that is relevant to where they live. In addition, participants will be able to interact with scientists and industry experts. “Our students will benefit from better understanding the education and career opportunities in aquaculture,” Cahoon says. These students grow up in a unique natural environment that supports careers in farming, fishing and ecotourism, among others. I look forward to seeing them capitalize on these assets, while making investments to preserve and restore them, and being part of sustainable economic development in Hyde County.